Annual fundraising gala, Bandage Ball, raises record $1.4 million for emergency services. On December 18, 2017, a train fell out of the sky. Or so it must have seemed to the drivers making their way to work on Interstate 5 near DuPont, Washington that morning when an Amtrak train derailed on a bridge over the freeway. Three people died and 62 sustained injuries requiring medical treatment at nearby hospitals. Train derailments thankfully happen only rarely, but the incident reminds us of a universal reality: accidents happen. No matter how careful, responsible and prepared you may be, you can’t stop the train from running off the tracks. 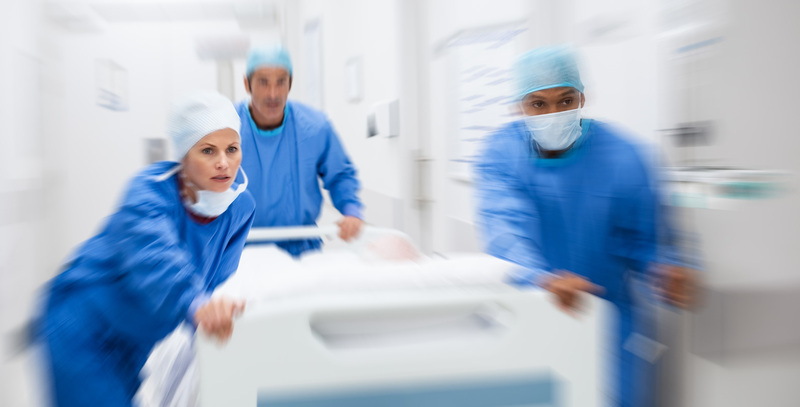 Accidents and other medical emergencies, such as heart attacks and strokes, make it critically important to have access to a top-quality hospital with a full range of emergency services. If you live or work on the Eastside, that hospital is Overlake, and we are here for you. Each year, thousands of patients come to Overlake for emergency medical care, and we are committed to providing exceptional, compassionate care to each one. In addition, we stand ready to serve our community in the event of any large-scale disaster, such as earthquake, avalanche, act of terrorism or even a train derailment. Maintaining our readiness to respond to emergencies, large and small, is of the utmost importance. We use training, drills, equipment checks and upgrades, and careful coordination with other regional providers and first responders to ensure that we are always prepared. At this year’s Bandage Ball, we honored the incredible lifesaving work done by Overlake’s emergency services department. The $1.4 million raised at the Ball will support the training and equipment that keep our program cutting-edge and enable facility improvements that will expand our capacity to care for our growing population. Please visit bandageball.org for more information.